We have kindly been given a pair of mens’ moccasins to review by fantastic Kentish business, Snugrugs, and just in time too. The weather has certainly taken a turn for the worse over the last couple of days. That being said, the good people at Snugrugs are not just concerned about our ability to keep warm this winter. They have kindly offered all of our readers 10% off everything online with the promo code ‘BRITISH10’. Get involved! Snugrugs were started in 2009 by husband and wife team Zoe and David Barnett. They started selling, as the name suggests, rugs and home furnishing made from animal hides. They have since expanded their range to menswear, ladies wear and luggage. They also boast now employing people in the States and in continental Europe. 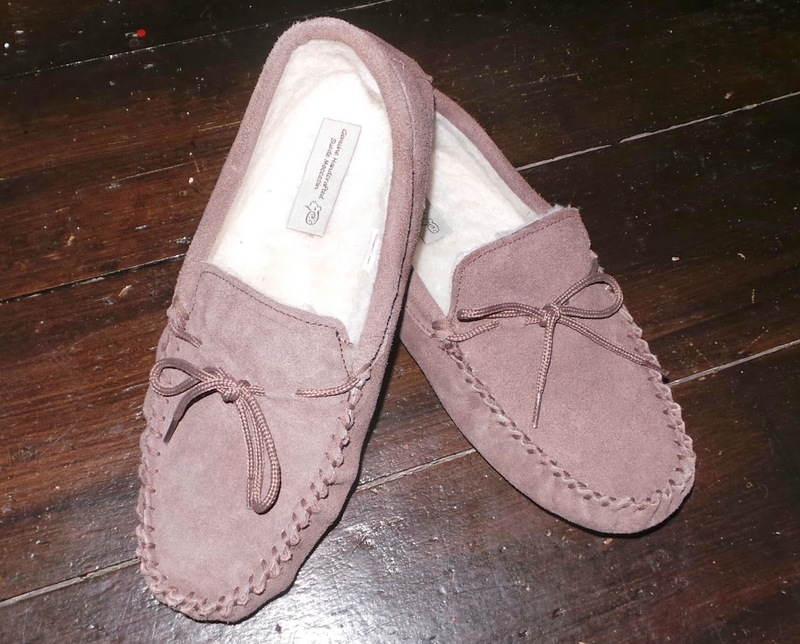 The moccasins we have to review are made from a light brown soft suede and lined in wool. The best thing about these slippers is the price. At £15.99 they are handmade quality for a high street price tag. We have seen (and bought) similar products at three times the cost that have little perceivable difference in quality. Originally moccasins were the preferred footwear if indigenous North American people and have seen continued use for about 5000 years. So, while they may remind many of what Granny used to wear or perhaps not fit the tastes of the trend-set they are a true design classic. I am a size 9 or 10 shoe and I opted for the lower size to ensure a good fit. They are just large enough for my ‘plates-o-meat’ but I suspect they will loosen up over time. I would recommend that if you wanted to wear socks with your slippers that you order a size above your normal shoe measurement. This is all well and good but surely only real measure of a good slipper is how comfy it is and I am glad to report that there are no issues their either. Would it be clichéd to describe them as ‘snug’? Perhaps but that is what I am inclined to do. If you are looking for a quality pair of slippers ready for the winter chill then buy your British made slippers here and remember to use the promotional code for your 10% discount. From their website it is not clear where their products come from and what part of what items are ‘Made in Britain’. If I buy a sheepskin rug I want it to be from a British sheep and processed in the UK – I suspect not in this case, and if they are why are they not putting union jacks or made in Britain next to the descriptions? They have a wide range of products and I wonder what percentage are Made in Britain? Maybe a question you should ask when reviewing items. Julie – that is a very good point. I will put these points to them and come back to you. I also agree that the clarity of sign posting, both on product and online, should be included in our reviews. We will bear this in mind. My slippers were made in Devon. Can’t remember the makers name. They do have Made in England molded into the soles. We do have an established shoe maker in Exeter, who hand make a range of footwear, all measured to your individual foot shape and size. I bought these exact slippers but in a size 10 for my husband the other week and he absolutely adores them! We love supporting smaller, local companies like this but there’s always that question about quality. These slipper have lasted really welll and for the price they are well worth the money. good choice James! I have bought these slippers from Amazon and snugrugs before and they are not British, they are made in China, the only company’s I’m aware of that sell British made moccasins and sheepskin items are Celtic & co and Lambland. Both are very good at making clear when a product is british. Really snugrugs is a good point of best quality sheepskin slippers than any other store.